The Observatory of Paris makes astronomy observations 24 hours per day, 365 days per year. The data gathered is made available to the scientific community all around the world via the internet. Completed in 1965, the Decimetric Radio Telescope is an antenna for receiving and studying radio waves coming from outer Space. The waves are similar to light, but of much longer wavelength: from 10 to 30 centimeter. At these wavelengths, a surface covered with a metal mesh works (almost) like a perfect mirror. The decimetric telescope has two such very large mirrors, which can direct the radio waves towards a focus where a receiver collects them and guides them towards sensitive amplifiers and other connected analysis electronics. This is where the HERON systems come in. 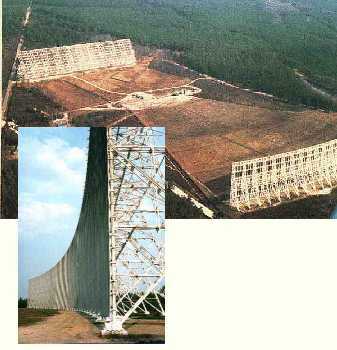 During 2002 a project was started to upgrade the Decimetric Radiotelescope to provide more sensitivity and resolution. HERON and HEART were selected from the possible solutions on the market because of the possibility to use FPGA technology for Digital Down Conversion and Frequency analysis, followed by C6000 processors for further analysing the results of the FPGA processing. The high sampling rate and signal to noise ratio provided by the HERON-IO4 was important as that is what enables the higher sensitivity and frequency resolution to be achieved. The HEART architecture along with the inter-board connections allow pairs of input channels to be processed and cross correlated using a pair of HEPC9 boards. Multiple PCs communicating on a network are then used to process all of the channels coming from the receiver.